Quick Stop convenience store clerk Dante Hicks isn't even supposed to be at work today. Luckily, his friends are also slaves to the grind, including Randal Graves, the clerk at the neighboring RST Video store, and the sidewalk salesmen Jay and Silent Bob. Just because they serve you... doesn't mean they like you. In the original version of Clerks, Dante gets shot at the end - it was the perfect ending, the ultimate FU from the universe for the guy who wasn't supposed to be there that day. The scene was cut before release though, so Dante lived on to appear in sequels. Dante is wearing a white T-shirt under a long-sleeved shirt, and they're both apparently tucked into his khakis. The moral here? Quick Stop doesn't have a uniform. 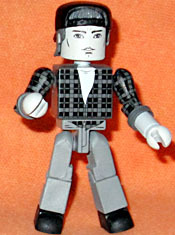 The likeness to actor Brian O'Halloran is good, with a slightly dumbfounded look and totally '90s hair. He has no accessories, but what would you give him? A gallon of milk? A pack of cigarettes? A candy cane? J. Jonah Jameson's newspaper, redone as a tabloid? The RST in "RST Video" stands for Rajiv, Sarla and Tarlochen Thapar, the family that owned the store until it closed in 2006. Randal is dressed pretty much the same as Dante, except his shirt is plaid and it's untucked, like a freaking savage. He's also got the sleeves rolled up to his elbows, thanks to the inclusion of two "cuff" rings, and is wearing a backwards baseball cap over his slightly shaggy hair. Despite the simple detailing, the face looks like Jeff Anderson. The paint is precise, both on the face and the shirt, but weirdly, the figure is molded entirely from pink "skintone" plastic, then painted grey - you can see it when the joints move. That seems like a lot of extra work. 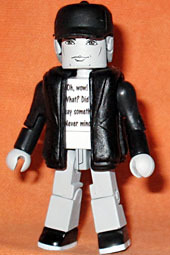 Jay has had a Minimate before, and this one is wearing the same coat. Yes, that one was from a different movie, but by painting it solid black, the re-use is disguised. He gets his long white T-shirt with the slogan that reads "Oh, wow! What? Did I say something? Never mind." Unsurprisingly, it does not feature Doonesbury's Mr. Jay on the right side. Nor does his hat have a San Jose Sharks logo on it. Damn you, copyright law and licensing fees! The hat is a new piece, with Jay's ponytail molded as part of it. The likeness is still not very "Jay-ish," but only because Jason Mewes has a face that's difficult to caricature. 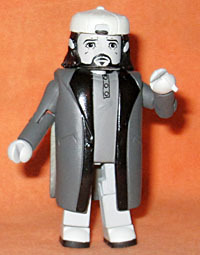 Like Jay, Silent Bob's coat is also reused from the previous release. Unlike Jay, Silent Bob doesn't even get the benefit of having his coat repainted. It's almost identical to the first one. The most substantial change is that the shirt visible in the center: it's been repainted to have some buttons at the neck. His hat is the same, his cigarette hand is the same... his pants are different, but they're nearly the same color as his face, so he looks naked. And speaking of his face, for some reason, the design they went with for it makes him look afraid. What are you afraid of, Schueler Bob? What dark visions dance before your eyes? Also all the figures have clear stands. The Clerks set does well honoring this 20-year-old movie - you've got all the characters who matter, in their most iconic looks. Is the black and white doesn't suit your style, there's an exclusive version of this set at TЯU that is identical, but everyone has been colorized. Ted Turner would be so proud!